Over at the Teach the Web MOOC, the task this week (week four) is to create a resource that will push our thinking around the work we have done so far with remixing, creating and more into the realm of education. This is a crucial step forward for those of us playing around with the Mozilla Webmaker tools and others. The task includes a hackable Thimble activity page that allows you to use a template to build and share a resource of ideas. What I was exploring in this resource is a push to give students and young people more agency in the world of digital media, and thinking about how tools such as XRay Goggles, Thimble, Popcorn Maker might engage them in the work and play of understanding the digital media world. In making not just the web more visible but also the intent of media producers, my hope is that young people become more active participants and creators, instead of passive consumers. This thinking is valuable to me, not just now with my sixth graders, but also for this summer, when I am slated to teach a digital literacy workshop for five weeks with high school students in a nearby urban center. The program, which the Western Massachusetts Writing Project is a partner to, aims for English Language Learners. My workshop with students will be centered around hacking literacies and video game design, and all this work with Teach the Web is really informing my thinking and helping me put the pieces together for the summer. This particular activity — the resource I am sharing here — gave me room to frame some of the larger ideas around using technology and digital tools to empower students. That’s an important message for me to remember, and nurture, and build lesson and activities off of. 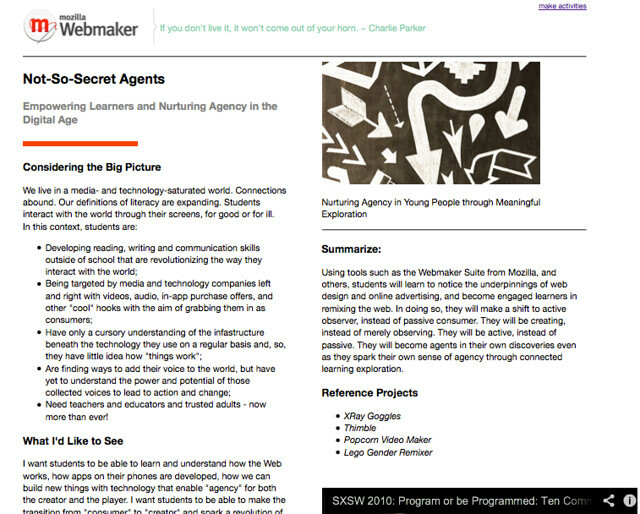 This entry was posted in TeachtheWeb, WMWP and tagged #teachtheweb. Bookmark the permalink.